In case you don’t read comments that follow my blog posts, Paulette had this to say about Friday’s All the Pretty School Girls post. I hesitate to cast a cloud over anything you do on this site, having been a big fan for many years. 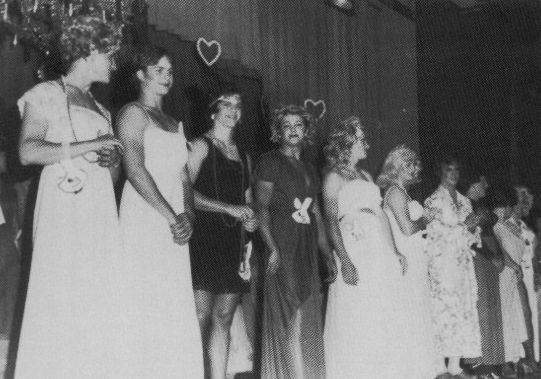 However, have you considered the possibility that these old buried cross-dressing photos (aka womanless beauty pageants) are better left undisturbed? In today's fevered environment, being outed on the internet could be most unwelcome. A dusty schoolbook yearbook is - thankfully for many - lost to history. And despite our prurient fascination in others like ourselves, we have no right to dig up potential problems that will strike 40-50 year olds and their families, like a proverbial bolt from the blue. Although we like to think differently, most of the people in the images are not femulators. Their high school femulation was a one time occurrence, so there is nothing to be outed about. About half of the images do not name the people captured in the photo; their anonymity provides protection from being outed. If anyone ever complains, I will delete their photo immediately. Femulating in the 1984 Italian film Cop in Drag. Who's gonna figure out who the girls are? Classmates? They already know. And anyone pictured can say "did YOU show this much school spirit?" Meg, nice to see that you're still watching the blogs. Have a great Holiday season. Another minor point about this topic: why would disinterested cisgender folks be crawling around in sites like this and others (to possibly come across old "high school cross-dressing" pictures of people they knew back in the day)? If they do, they must have a significant interest in cross-dressing and/or transgenderism! Earlier in Mandy's dressing days, such would have been the general defense I would have used, had anyone discovered my on-line stash of pictures/blog. The "outee"- me - would then have leverage to "out" the "outor" - them. But I never had occasion to use that line of reasoning. Why, you ask? I wore women's pants, flats, and occasionally tops to work every day. It was impossible to hide my trademarks - long, feminine hair and pretty acrylic nails. Though my nails were almost always in subdued translucent pink colors, not solid bright reds and oranges like the other girls preferred. Whenever I moved my hands, with my white French tips, my nails were plainly visible. And they were much longer than many of the other girls. Fast typists didn't have long nails. I wasn't a typist. They all recognized my women's clothes and nails for what they were, and didn't care, thus I became more a member of the "girls club" than the "boys club." If a guy donned a skirt for some school event, odds are his immediate family and longtime friends already know about it. The yearbooks are out there on the Net, searchable and browsable to anyone who makes the effort. They are still rather obscure - the text of the website that collects and digitizes them is not crawled by search engines - you have to go to their site, register and search there. And the images we borrow have the caption text as part of the image, so the names still won't turn up if someone - say, a prospective employer - googles them. I'm with Stana on this - use the photos, but quickly delete any image for which a complaint is received.